Cymbal taps, tumbling toms, a dancing bass figure, pastel piano overlays, an ambling groove and then-could it be?-a familiar melody straight out of ’70s pop radio. That drummer Jeff Hamilton, leading a trio with pianist Tamir Hendelman and bassist Christoph Luty, can transform Stephen Bishop’s once-forgettable ’70s radio hit “On and On” into a nuanced jazz ballad is a testament to the bandleader’s abilities as a conceptualist. 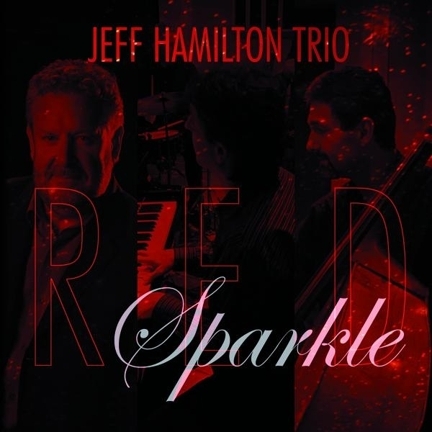 Hamilton demonstrates those finely honed talents throughout Red Sparkle, its name a nod to the hues of his first drum set, realigning Monk’s “Bye-Ya” with Latin rhythms, amplifying the lushness of “Laura” and turning in brushes derring-do on a tete a tete with Luty that launches “A Sleepin’ Bee.” Hamilton salutes one of his mentors with a lovely stroll through late, great bassist Ray Brown’s “I Know You Oh So Well,” its theme bowed by Luty, and swings with conviction on “Too Marvelous for Words,” which opens up for an extended, melodic drum solo. The originals shine, too. The bluesy “Hat’s Dance,” named for Hamilton’s mom, is invigorated with a palpable rhythmic bounce, as is “Ain’t That a Peach,” penned as a tribute to longtime Clayton/Hamilton Orchestra trumpeter (and swing-era veteran) Eugene “Snooky” Young. Another hero is toasted on the album closer, “In an Ellingtone,” a swing stomper that builds to great intensity; the track opens with a few seconds of the bandmates’ laughing, perhaps at the intensity of the tune’s exuberance. It’s catching.